When he was 8, Bob started longlining mice for the “live market” (Helen Perley of the nearby White Animal Farm paid 10¢ per live mouse, making Bob the neighborhood Candy Bar King). He quickly graduated to muskrats and raccoon, and when he caught a red fox in a foothold trap set for rabbits in his freshman year of high school, he decided to trap for a living. At age 68 he hasn’t missed a season yet. He trapped full-time for 2 months every year during the Fur Boom (1975-1987), and currently traps fur and nuisance wildlife part-time. He’s been a full-time freelance illustrator, cartoonist, writer, and editor for over 25 years, and has produced countless articles and drawings for many trapping publications, including Fur-Fish-Game, Trapper and Predator Caller, and International Trapper. He has interviewed, and spent time on the trapline with, a number of professional trappers. He was also editor of Wildlife Control Technology (WCT), a national magazine for the nuisance wildlife (ADC) industry, for 17 years. Mike grew up in Kansas and Wisconsin, in a hunting and fishing family. As a kid he trapped grain-eating chipmunks in the chicken house, and by high school he had caught every available furbearer in the area, including coyotes. He spent so much time hunting and trapping his teachers called him "One Who Walks in the Woods." After graduation he trapped fur, briefly bought fur and sold trapping supplies, and for years put up fur for other trappers. In 1992 he began writing for The Trapper and Predator Caller, and has since contributed regularly to International Trapper, Wisconsin Outdoor Journal, Wildlife Control Technology (WCT), and Trapper's Post. Through the years he's been the "go-to" guy for editors with trapping questions, especially in regards canine trapping. His nuisance wildlife control calls increased until in 2003 he went full-time from spring through fall. He traps fur the rest of the year. He is also an avid big game hunter, and has taken elk, bear, and numerous deer with firearm, muzzleloader, and bow. Mike is also an instructor in trapper education classes, speaks to local clubs and organizations on fur trapping, animal damage control, and zoonotic (wildlife) diseases, and is a regular speaker at the "Fur School" at the University of Wisconsin College of Natural Resources. Traci has lived in the country most of her life, and loves the outdoors. As a kid she made mud pies in the spring, swam in the lake in the summer, raked leaves to dive into in the fall, and made snow forts in the winter. She loves the four seasons, whitetail deer and turkey hunting, and shooting 22 pistols. For over 20 years she was a partner in a butcher shop in central Maine that cut deer and moose during hunting season. She loves talking to all the hunters during the season and listening to their stories. Traci is no stranger to business and sales. She has worked in a family owned retail business for 25 years, and for 18 years she owned and managed four rental units. Born in Washington, D.C., to Mainer parents, as a youngster Jenny spent many summers at camp in Maine. Her father's work took the family to England for several years in the late 1960s and as a result she is still an avid reader of British literature and thinks of northern England as her second home. Jenny is a big fan of ink on paper, and used to make her own books as a child. Her first job-at 16-was proofreading articles for publication, and she has been involved in the publishing and graphic design field ever since, as a professional. Since 1990 she has been the Publication Director for Hebron Academy, and also freelances, designing everything from theater programs to newsletters, circulars, ads, and magazines. She is an avid sailor, active in the local community theater group, and camps all over Maine in the summer. She and her husband Russ live in South Paris, Maine, with Nugget, their Australian cattle dog. Sharon grew up in Florida, riding in the horse industry, and her love of horses led to her first art sales as a teenager -- portraits of show horses. Her study of wildlife led to more sales, from private commissions to businesses, including air-brush murals on show vans and motorcycles, screen-printed art on garments, company logos, mugs and steins, horse and gun dog training books, and numerous outdoor magazines. Her favorite work is doing ADC and fur trapping illustrations because the illustrations depict real wildlife behaviors and animals that other clients don’t allow in such stark clarity. Her pen and ink furbearer and “varmint” illustrations look like they could walk off the page. 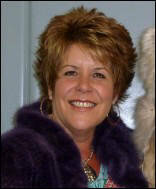 Sharon enjoys her passion of horsemanship, and large-caliber rifle shooting at targets and long range. She also hunts and has a consistent record of one shot kills on big game and varmints. Penny was born in Wisconsin and moved about to Arizona, Colorado, Florida, and Indiana before settling back home. Penny has worked at various jobs. Some of her most interesting work was in electronics: building, testing, calibrating, and repairing computer boards, and writing the company manuals for them. She was introduced to trapping nearly 30 years ago, after marrying Mike. She has accompanied him numerous times on his trapline, and has taken some of his best trapping photos. For over a decade she was Office Manager for Mike’s business, Wilhite Wildlife Control, the job she enjoyed most. In that capacity she also occasionally removed bats and snakes, and was a proficient chipmunk and woodchuck trapper. Her considerable phone, people, and computer skills made her a real asset to Mike’s business, and she brings those skills, and her goal of customer satisfaction, to Trapper’s Post. Penny enjoys spending time with friends and family, as well as being outside as much as possible, gardening, camping, fishing, and photography. She loves sitting around a campfire with friends late into the night, and morning coffee on the porch with a good book. She and Mike freeze and can most of their food, from their garden or the wild game Mike shoots. Chris has been a native of Wisconsin her entire life and currently lives in Scandinavia, close to the Wisconsin Trapper’s Post office. She grew up in a large family, and shared adventures with her brothers more than with her younger sisters. Those exploits included bike rides, ball games, fishing (after digging the worms and picking the nightcrawlers), and frog and crayfish hunting. She still loves fishing. Her husband and two sons have been lifelong deer hunters and have also hunted elk out west. Although not a hunter, Chris helps cut up the deer and prepares many great venison dishes. Three granddaughters, a large garden, a few chickens, a dog, and two cats occupy her spare time. Chris worked for Krause Publications for 13 years, holding various positions including Typesetter, Special Assignments, Circulation, Sports Division Administrative Assistant, and Show Division Assistant. She then became Executive Assistant to Chet Krause, founder of Krause Publications, handling, among other things, his extensive databases. She held that position for 17 years, until his death. Chris is well known for her outstanding computer skills and is adept at managing Excel files for circulation, invoicing, etc.